Today, I want to discuss the beautiful intersection of two buzz words currently making a splash in the game community: gamification and Kickstarter. Klout uses scores and achievements to gamify something that is pretty much already a game, social media. 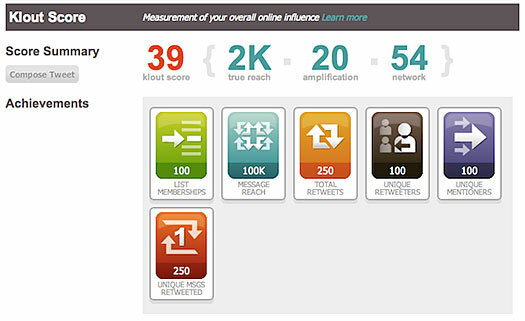 Image from socialbrite.org. For those of you who don’t know, gamification is a process by which one adds or emphasizes game like qualities in non-game activities to make them more appealing. For example, you might get a score based on how much you exercise and then compare it to your friends’ scores on a leaderboard. Or you might earn achievements at work to try to make you more productive. However it manifests itself, the basic idea for gamification is to leverage game design theory to shape people’s behavior in a realm more important or significant than a game (like there is one). The gamification movement has recently been quite large and very controversial. Some game gurus, such as Jane McGonigal, have fully embraced it, believing that it’s the wave of the future that will improve our lives and harness the power of play to accomplish greater things. Others, such as Jesse Schell, have painted more of a dystopian future in which we lose our sense of inherent value because artificial, perhaps nefarious values are applied to everything in our lives (see around minute 20 here, though the whole video is good). Whatever your particular thoughts on gamification are, it seems to be here to stay: many game industry veterans are making a transition to consulting work with companies to gamify their websites, employees’ experiences, and a whole lot more. Even if people cool to the idea at some point, it’s hard to argue that gamification hasn’t been hugely successful even before it got its name. Who’s going to say that militaries haven’t harnessed achievements and ranks for centuries to motivate their members? Step 1: Any random yahoo (like me) puts up a project idea. Step 2: Potentially thousands of people see the project idea. Step 3: Some of those people support the project by giving said yahoo some money. Step 4: If the project raises enough money from random people, the yahoo gets a bunch of money to make his or her project a reality, giving the supporters the project and possibly some swag. Honestly, this is a natural direction for the internet to go. Just like file sharing has reduced the importance of record labels to help distribute music to consumers, so crowd funding has reduced the importance of traditional investors in getting a project completed. If people want something and are willing to pay for it themselves, why not cut out a middle man? 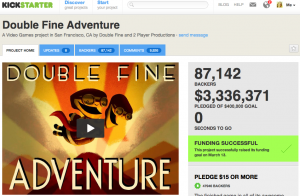 Double Fine made an ungodly amount of money from Kickstarter. Image from design3. Kickstarter has been incredibly successful, generating huge buzz with projects that reap ridiculous amounts of money. For games especially it has been a real game changer, so to speak. While I feel like there’s a decent chance there will be a bit of a backlash against crowd funding in the near future (not all projects satisfy their customers), it’s too great a way to foster creativity and originality to completely die out. For those of you who don’t know, I’m planning on kickstarting Corporate America in the very near future. In preparing for the big plunge, I’ve spent a lot of time researching Kickstarter and what a project needs to succeed. There are some obvious things, like an interesting, fun idea and a catchy video. But I was surprised to discover how much game like structure many projects adopt to encourage their backers to not only spend lots of money, but to get their friends to spend lots of money too. Here are a few of the game like patterns I’ve noticed. This may not be a surprise, but it’s definitely true: Kickstarter allows consumers to feel like they’re producers. In many senses, it’s true, since without their support a project would never become a reality. However, it also has the very positive benefit of getting supporters emotionally attached to projects. Games are interactive above all else, so the connection here is a no brainer. By making the funding process less of a one way transaction and more of a two way back and forth, Kickstarter projects get people involved and excited so they actively want to help make the project become a reality. Those of you familiar with Kickstarter already know that funders pledge money to projects and get rewards based on how much they pledge. For $1, you might get a thank you in the credits of the game you’re supporting. 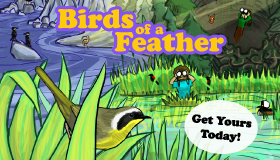 For $10, you might get a button with some art from the game you’re supporting. For $50, you might get a copy of the game. For $200, you might get a print of some gorgeous art from the game signed by the artist. This system allows people to pledge as much as they want (or can afford), which is a nice feature. One tiny tweak to this system I saw when I started exploring Kickstarter more closely was the application of titles to reward tiers, often themed with the project in question. At $10, you might be a Green Recruit, but at $250, you’re a General. It’s straight out of the playbooks of any number of games that adopt a ranking system to encourage players to spend more time working towards a higher title. It adds status to the material goods you get from a particular funding tier–a very cheap way to add some real value for your supporters. Another quick aside about reward tiers: many include leaving some sort of mark on the final product. It might be as simple as your name appearing in the rulebook in a thank you section, or it might be as complex as one of the characters being rendered in your likeness. Whatever the details, it’s yet another way for supporters to get involved in the eventual project, adding to the emotional link. One of the most surprising patterns used by Kickstarter projects is the stretch reward. On a basic level, Kickstarter is an all or nothing service: project leads decide on a monetary goal they’re trying to reach; if they reach that goal, they get all the money pledged to them (except Kickstarter keeps a bit, of course); if they don’t reach that goal, they get nothing. In a way, this makes Kickstarter like a game for those running the project: how much are you willing to wager you can raise? If you don’t think you can raise everything you need, do you aim low, accepting that you might have to pay some of the cost of the project out of pocket? But there’s another twist to this equation: if you raise more money than you requested, you still get to keep it all. Generally, you’ll want to make more money, especially if you undershot to ensure that you can realistically reach your goal, but how do you incentivize people to continue supporting your project even after you’ve reached your goal? That’s where stretch rewards come in. The idea is simple. We’re shooting for $10,000, but if we happen to make $20,000, everyone gets a little extra! The little extra might be some additional swag or it might be improvements to the project. It might even be a promise for ongoing support or another product down the line. Now it’s no longer a single player game. Just like with many “social” games on facebook, everyone does better the more players there are. If you’ve already pledged and the project is at $19,000, you’re definitely going to try to get your friend to pledge too. If the project reaches $20,000, you get more stuff and you didn’t have to pay anything for it! Not only is this a way to get nearly free word of mouth advertising, it also (once again) gets a project’s supporters more emotionally invested. Today, I took a look at some things that might not be particularly appealing to many people. Gamification has a pretty bad reputation within much of the gaming community, and using game mechanics to manipulate people, especially into giving you money, is generally frowned upon. But before you pass judgement, remember that gamification is something that has existed for a long time (much longer than the term has) and that it’s helped people deal with things they would otherwise struggle with, like staying in shape and eating right (think Weight Watchers). Even though the current gamification movement is a bit overblown, and people will realize that gamification is not the miracle cure they have been waiting for, gamification will always have a place in our society. In the near future, I think that Kickstarter will have a bit of a backlash. Right now, people are very excited about it, but as more people attempt to make a quick buck from it, and more promises fall through, people will back away. That doesn’t mean that it won’t live on, though. It is the perfect tool for the internet age: it lets creative people with unique ideas to plead their case to the few people scattered around the world who are interested. Either way, I’m planning on making use of all of the tools I discussed here for Corporate America’s Kickstarter campaign. I’ll even be experimenting with some new ideas. So stay tuned–very exciting updates on the horizon! OMGpWnEdhaxorz!! !1 I can’t wait to throw my hard-earned dolla billz at the Corporate America Kickstarter campaign. In other news, what is “nearly free word of month advertising”? Price mark-up doesn’t need to be as high, allowing components to be made by companies that don’t exploit their employees. Community-created content. I see forums shooting up about some of these boardgames, that allow the supporters to be in constant contact with the creators, and ultimately allow the supporters to help the creators get even more feedback than traditionally available. I would hate to see the same thing happen to game stores due to crowd-funding. I don’t think it will, because so much of playing a game is having a group of people to play it with, and game stores have pretty solid communities of customers that go to play games and make friends as well as shop for new games. I’m confidently hopeful that this won’t put game shops out of business, but I’m also wary. I can’t wait to get your money either Simon!!! “Nearly free word of month advertising” is all the rage these days in game design. I’m honestly surprised you haven’t heard of it before… I’ll have to post about it one of these days. I wholeheartedly agree that Kickstarter is a real gift to board games in particular. Making a board game requires a huge investment (since you must print a very large number for them to be cost effective), but your potential players are scattered lightly around the world. Kickstarter allows you to ensure that you have enough support to warrant putting in the investment, as well as helping you raise the money for the investment in the first place. As far as the future of game stores, I wouldn’t worry too much about them. Some boardish games are going digital, but most are still physical, and game makers need a retail outlet for their games. Also, like you said, board games are very much about the community, and game stores are perfect for that. Great article, really relevant points.